It’s perfectly legal for contractors and vendors on the controversial Kemper Project or any utility project to give campaign cash to candidates for the Mississippi Public Service Commission. The PSC on Tuesday rejected unanimously Thomas Blanton’s motion for Central District commissioner Lynn Posey to recuse himself from Kemper Project-related proceedings. Blanton is a candidate for the Southern District seat as a Democrat. A filing by Blanton’s attorney last week alleged Posey received campaign funds from contractors on Mississippi Power’s Kemper Project power plant, and that it amounted to a conflict of interest. Posey, who is retiring in December, has voted yes at every juncture to approve the controversial plant’s construction. He has voted for every proposed rate increase. “The filing speaks for itself,” Blanton told Mississippi Watchdog. Posey could not be reached for comment. Bailey said he would not support changing the campaign finance laws if they only applied to PSC commissioners and candidates. According to Section 77-1-11 (1) of theMississippi Code, it’s unlawful for a PSC commissioner, candidate for PSC or any employee of the PSC or the public utilities staff to accept any gift, pass, money or campaign contribution “from any person interested as owner, agent or representative, or from any person acting in any respect for such owner, agent or representative” of any utility regulated by the commission. Mississippi PSC commissioners are the only statewide elected officials with prohibitions on who can — or can’t — give to their campaigns. The law was changed in 1990 — from “anyone connected in any way with a utility” regulated by the PSC to give a gift or other benefit to a member of or candidate for the PSC to the current, more specific language. According to the commission’s order, independent contractors aren’t considered agents of the regulated utility because the intervenor, Blanton in this case, would have to prove the contractors were acting directly at the behest of Mississippi Power. According to an AG opinion issued May 22, 1990, by then-attorney general Mike Moore, the original law would have prohibited any attorney or engineer who regularly represents or works with a PSC-regulated utility to contribute to the campaign of a public service commissioner or a candidate for that office. According to the opinion, just because an engineer, vendor or contractor has done business with a utility at some point in their career does not prohibit them from contributing to a candidate for PSC. 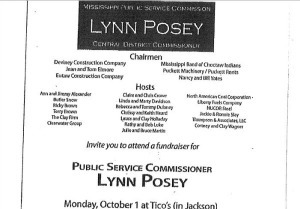 The core of Blanton’s request for Posey’s recusal stemmed from simultaneous fundraising dinners for Posey at Tico’s Steakhouse in Jackson and Weidmann’s in Meridian in October 2013. Eutaw Construction Co., Puckett Machinery Co., Puckett Rents and Yates Construction Co. hosted the fundraisers. All have done business with the Kemper Project and are listed as such on the monthly Kemper progress reportsfiled by Mississippi Power with the PSC. The hosts at the fundraising dinners paid a minimum of $1,000. Kemper contractors Business Interiors, Magnolia Steel Co., Southern Pipe and Supply, Engineering Plus Inc., Puckett Machinery Co. and Structural Steel Services Inc.donated to Posey in 2013. Mississippi Power admitted that all were contractors or suppliers on the Kemper Project. Eutaw Construction received more than $2.7 million in contracts, Puckett Machinery more than $8.3 million, Puckett Rents more than $129,000 and Yates Construction more than $54 million. Business Interiors received more than $110,000 in Kemper-related work, while Magnolia Steel (more than $541,ooo), Southern Pipe and Supply (more than $845,000), Engineering Plus (more than $195,000) and Structural Steel Services (more than $10 million). Blanton filed a lawsuit that resulted in the Mississippi Supreme Court ordering the company to refund $350 million in rate increases to help fund the $6.267 billion plant, which converts lignite coal into a natural gas-like substance called synthesis gas. The plant is two years behind schedule, billions over budget and is scheduled to be operational by no later than April 19. The PSC will hold a hearing Nov. 10 for permanent rates on the combined cycle and other working plant assets and will issue a ruling by Dec. 8. The court ruled the company could not collect rate increases before the PSC decides, in a prudency hearing, whether the spending on construction was justified. If the commission rules the utility’s spending was justified, it could then pass costs on to customers via rate increases.